Mobile Mouse allows you to turn your iPhone, iPad or Android mobile into a fully functioning wireless mouse, touchpad and remote for your computer, enabling you to tuck the computer out of the way while you navigate using your mobile device’s touchscreen. All you need to do is ensure both are on the same wi-fi network. In other words, it basically allows you to set up connection details and fully configure interactions in order to control your PC from a distance using your preferred mobile device. Mobile Mouse is very easy to use and suited to professionals and novices alike. Controlling a computer from a distance is not something new and this can be done from another computer that is connected to the same network. However, with the help of Mobile Mouse Server you can use your iPhone or Androind device to accomplish this task, changing the way presentations are made or simply handling multimedia applications without the keyboard or mouse. This application only represents half of the requirements needed to control your computer from a distance. As the name suggests, it acts like a command center from which you can configure interactions between your PC and device so you just use your phone as a remote control without any further settings to manage. You can only connect to the PC if there is an active Internet connection, thus you can set up details such as IP, port, as well as a password from the “Server” tab. Additionally, the application let's you simultaneously establish a connection via multiple IPs by simply checking the “Listen on any” box. Air and touch motion, as well as scrolling sensitivity can be easily configured by adjusting several dedicated sliders that represent movement axis and speed. What's more, a list of controllable installed applications can be created so you can quickly launch them from your device. 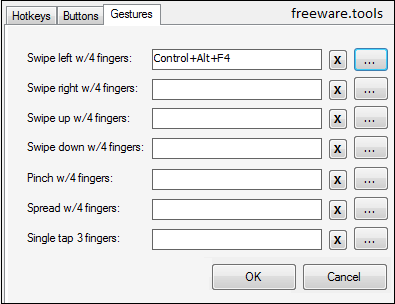 Furthermore, hotkeys are fully configurable, with the possibility to determine what buttons and gestures trigger, and if you happen to own a stylus you can use its buttons too. Up to nine gestures are available for you to set, ranging from swiping your finger in certain directions to pinching and tapping. Taking everything into consideration, we can say that Mobile Mouse Server might not mean much as a stand-alone application, and nor can it since it is one of the main ingredients that change the way presentations are made. It's compatibility with various commonly used devices and platforms make it an application worth at least a try.